The reigning BETFRED Super League Champions return home on Friday for the first time since their semi-final victory over Castleford Tigers last October. Joe Burgess is still on the comeback trail following a knee injury sustained in April 2018. Jarrod Sammut serves the second of his two match suspension against Leeds. Last week’s injury concerns Tony Clubb and Gabe Hamlin are both confirmed fit to play this Friday. Joe Bullock, Tony Clubb, Tom Davies, Morgan Escaré, Liam Farrell, Ben Flower, Oliver Gildart, Joe Greenwood, Gabe Hamlin, Zak Hardaker, Willie Isa, Tommy Leuluai, Liam Marshall, Romain Navarrete, Sean O’Loughlin, Sam Powell, Dan Sarginson, Taulima Tautai, George Williams. Think he will go with the same team as last week. I would like to see Escare on the bench, but I can't see him dropping anyone after one game even though a couple were poor. Need to get the Leeds and WCC games over before he can start to look at other options. Looking forward to seeing Hankinson at centre and Sammut, but I think he'll stick with experience for the next two. 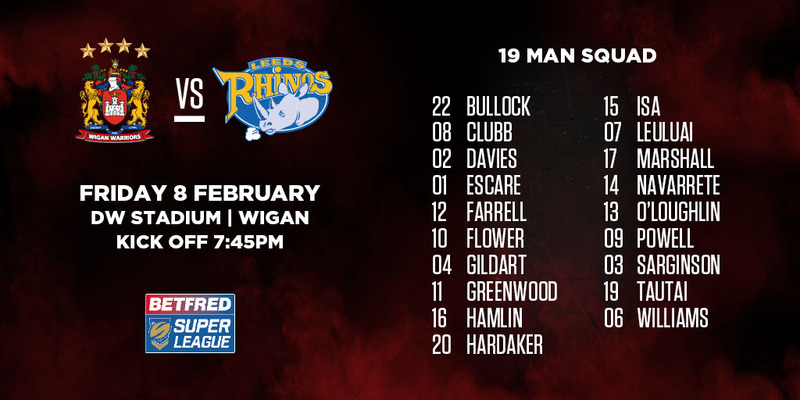 Leeds Rhinos have made two changes to their 19-man squad to face Wigan Warriors on Friday night. Both Harry Newman, who featured for Featherstone Rovers last week, and Nathaniel Peteru come into the squad for Jamie Jones-Buchanan, who missed the Rhinos’ opener through a chest infection, and Cameron Smith, who wasn’t involved in the matchday 17 against Warrington either. Meanwhile, Wigan Warriors have named an unchanged side from their opening day defeat to St Helens. Both Joe Burgess and Dom Manfredi are still missing with knee injuries while Gabe Hamlin and Tony Clubb have both been confirmed as fit to play after injury concerns. Leeds travel to Wigan without a win since 2013 at the DW Stadium. Warriors squad: Joe Bullock, Tony Clubb, Tom Davies, Morgan Escaré, Liam Farrell, Ben Flower, Oliver Gildart, Joe Greenwood, Gabe Hamlin, Zak Hardaker, Willie Isa, Tommy Leuluai, Liam Marshall, Romain Navarrete, Sean O’Loughlin, Sam Powell, Dan Sarginson, Taulima Tautai, George Williams. I'll be happy with signs of progress and two points to set us up for the WCC. A loss may affect the crowd for next week. I'd expect the same 17, although he may try Tautai for Romain, and then put Sammut in next week if our kicking game isn't much improved. Glad to see it's looking like they won't rush Dom back. He's far too important to take any risks with at this stage of the season. We all have bad days at the office, the 17 from last week need another opportunity to prove they are worthy of a place in the side. The squad virtually picks itself because if you look at the first team squad there isn't much depth to it in terms of alternate options even if we have depth on the wings. There is no hot prospect like a young Sam Tomkins pushing for a place. I think I am right in saying we have 22 (and that includes Bulluck) experienced players then it is into new names. Lam does not have much room to maneuver as in trying different players. The injuries to Manfredi and Burgess are covered by Marshall and Davis and it's good to be able to do that but it's like for like. Escare or Hardaker would seem to be the choice (don't know when Escare is going to get a game) and there is a potential to change a prop or two but I don't think you will see the sides picked this season vary very much at all injuries allowing. We are looking to Sammut to add the spark and of course he is not available tonight.